When I mention Symbian, many of you are probably thinking about its terrible implementation. About regular freezes and occasional reboots for no reason, a terrible touch layer, “Not enough memory” pop ups showing up when only the messaging application is open, and most of all about the horrible thingie which Symbian has dared calling its SDK for ages before finally going in the way of sanity with Qt near the end. Sure, Symbian was a bit lacking in terms of implementation quality, especially near the end. But there was more to Symbian than that, otherwise it would not have been #1 smartphone operating system for so long. In particular, here are three reasons why I think Symbian should be missed. First, Symbian was one of the last remnants of a time where developers of the mobile space optimized their code for performance, even when they worked on microkernels. Where 1 GHz was not the minimal CPU spec for getting a smooth calling and texting experience. Where 24 hours were not an acceptable battery life. As such, it was one of the few things which made the choice between a simple $60 feature phone and a $700 high-end “smart” phone less clear-cut as it becomes today, as good mid-end handsets become increasingly hard to find. With Symbian, people got a fair compromise: a more advanced experience than on low-end phones (and even some high-end phones) without spending the price of a laptop either at purchase time or in overpriced data plans. Second, Symbian was a true phone OS. A phone is fundamentally a communication-centric device (after all, that’s why we’re paying every month for the right to use a mobile network, right? ), and Symbian put an emphasis on communication between people. The Symbian home screen, in particular, was very good at that on keyboard-based phones. It’s obvious that the guys who created it took a lot of care in designing a great communication experience. When properly configured, just look at it, and you instantly know about incoming texts, missed calls, agenda entries and unread e-mails. Things are clearly separated from each other, and good visual hierarchy makes sure there’s no information overflow. Want to call or text someone? Just type the beginning of its name, without even leaving that home screen, and it’s just a matter of playing with the joystick. You also have quick access to your favorite applications on top. Here are some shots from my Nokia E63’s home screen so that you can better see how this works. Now let’s compare this to what the iPhone 4, one of the most successful high-end smartphones from today, has to offer for its $700, shall we? It sounds like after some years of putting the text app in the central application heap hell, Apple have finally discovered the importance of communication functions on a phone and decided that it would go in the dock at the bottom (along with “iPod”). A decision that was certainly just as welcome by users as the inclusion of bleeding edge communication technology like video calls or, earlier, MMS. 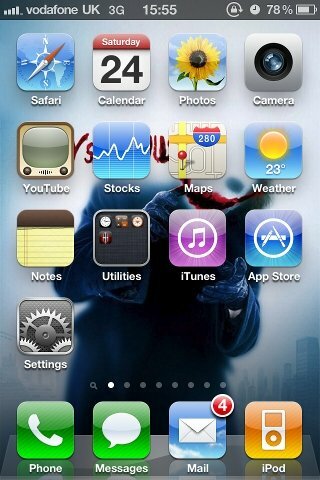 Apart from that dock and the status bar on top, visual hierarchy remains largely an unknown concept on Apple’s handset. The iPhone home screen is essentially a big heap of applications, spreading on several virtual screens for optimal usability, and giving you only the bare minimum of information about the communication and organization side of things. For anything more, you’ll have to find and open the right application. Just grabbing the phone out of your pocket, pressing the red button, having a quick look at what’s happening, and then putting the phone back in your pocket, is not an option. This is why I say that OSs like iOS are not true phone OSs. They are so generic that you could put them on a DAP or a tablet without changing a thing and they would work just as well (oh, wait…). Phones have very small screens and limited hardware capabilities by design (they have to fit in a pocket), a setup which literally scream for an optimized interface, and we have seen years of evolution in such interfaces in the previous years. But modern high-end smartphones just ditch it, for better of worse, in favor of a desktop-wannabe, application-centric interface. Oh, by the way, when was the last time we’ve had an application-centric interface on the desktop? 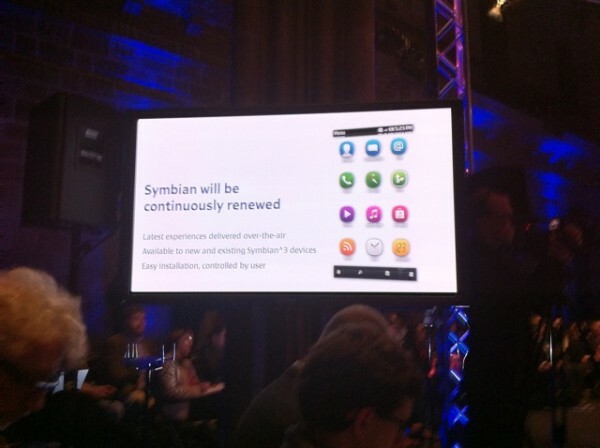 Finally, the end of Symbian is also the end of an era as far as developer power is concerned. Sure, the Symbian SDK was clunky as hell. Sure, the application signing process required in order to get full access to system capabilities was a true rip-off ($200/year + $10/signed app, really?). But for the price, you really got the right to do whatever you wanted, with native code, and in the last few months you also had the powerful Qt toolkit on your side. You distributed your applications to whoever you wanted, and they installed them simply by transferring them on their phone via standardized bluetooth or USB protocols and running them. As a developer or user, you could be largely independent from the phone manufacturer, if you wanted to. For the time being, rest in peace, Symbian OS, son of EPOC. You’ve done your duty well. Credits : Windows 3 screenshot from ToastyTech’s GUI gallery, courtesy of Nathan Lineback. I honestly thought that Symbian would pull through, that Nokia could do an WP7-like transformation on it (after all, WP7 is still the good old Windows CE kernel, though a more modern version, with the .NET framework, Silverlight and XNA running on top to create a modern interface, and was built in a very short amount of time). I am still not sure if it really was technically infeasible, but Nokia either way failed to do so for many years, so it seems fair to say that it wasn’t going to happen the way they were doing it at least. Interestingly one of the many Nokia plans (http://nokiaplans.com for anyone who have someone missed the meme), Plan I, actually suggests that the Symbian team inside Nokia was a big part of the problem getting a modern OS together: http://nokiaplani.com . Overall Plan I has some interesting thoughts. Plan I is exactly what I suspected. Qt then came in via Meego and they then embarked on some half-arsed implementation of Qt on Symbian that took forever to produce any results. It always seemed that the Symbian side of the company became very protective of itself against Meego, Android or the notion of any Linux based OS. In a way Symbian brought it upon themselves, but the right strategy was to go Linux and do what was necessary to maintain some control over their platform. the right strategy was to go Linux and do what was necessary to maintain some control over their platform. I’ve really got nothing against Linux on high-end phones, but on mid-end phones it’s simply not right at the moment, and will probably remain so for a long time. Thus, as long as Nokia did not want to become Apple and only sell high-end hardware, or to become LG and stop caring about the quality of user experience and start to shove Linux on hardware where it obviously doesn’t run well, Symbian had to somehow remain part of the equation. Nokia could also work on a Linux-based system in parallel (which they did), but they couldn’t fully dump Symbian that easily. But haven’t they just doomed themselves to a high-end only strategy? You never see a Windows phone now with a CPU less than 1GHz, and pretty soon, those will be obsolete (providing manufacturers of WP7 handsets jump on the Tegra 2 bandwagon. Does WP7 even support multiple cores?). I don’t know about other countries, but in Australia at least, Nokia is what people want when they want something that’s just a phone. Every customer of mine thinks Nokias are easy to use (an opinion I don’t share – they only think they’re easy to use because all they do is talk and MAYBE text), and if Nokia are moving to a WP7 only future, it will be the death of their dumbphone market, the one place where they have clear supremacy over other companies. Hell, it’s a phone… One of my cousins recently bought a ~10 year old Nokia, replaced the batteries and is a happy camper. I understand him, if you want a phone, which you actually use for real communication (yeah, that is voice) then simplicity, small size, and >7 days of battery is a real blessing. S40 will stay for low-end. And then there’s S60/Symbian^1 and Symbian^3 where the later will be around for at least (?) two years. Plus they will push WP down lower on the ladder. So no. I think they have plenty of bases covered. However maybe the low-end phones could had get S60 or Symbian^3 instead? But if price and battery consumption is the most important factors maybe not. I think Nokia know how to handle the un-developed market. The low-end Android phones don’t have to be that bad. My X10 Mini gets four days when only idling (or a few hours of Angry Birds), it’s fairly snappy, but only 600 MHz. Of course, I’ve tweaked it a bit with a new home screen and using link2sd to save memory, and the modest QVGA screen means it doesn’t have to push so many pixels. It costs less than the cheapest netbooks. Spoken like someone who hasn’t used Palm’s WebOS on the Pre. That is certainly a mid-range device (500MHz) and costs $150 outright from Bell, and is then eligible for a $15/month discount. I would easily get 2 days out of a charge with light use. And it’s a simple & elegant OS with an excellent notification system. You can get a ZTE or Huawei Android device for less than a Nokia C6/C7/N8. Is it slower than the fastest devices? Yeah most likely. Regardless I think you can get Linux to work to. And I assume MeeGo is pretty stripped. And hardware specs will just improve. Sad about Symbian though. Such a capable OS. It got multitasking, the E7 can use Exchange, still do some Office work, VPN, most likely act as a hotspot (with additional software at least), their co-operation with IBM and Lotus would probably had gone somewhere? So on so on. But it’s not dead yet and it will be improved for a while. And maybe we’ll see MeeGo devices to if they lift of / once they are ready. At least I guess WP gives a low developer threshold which let more people develop more in less time. Which obviously also got it’s benefit. Symbian has more future ahead of it than you’d think. Plus, there will be 200+ million devices running Qt Quick. You got a great chance of doing a pretty compelling app that can do well financially. You may find that Symbian is just *starting* to stop sucking. Esp. for Qt developers, Symbian is where the money will be made. CTO and Nokia QT head saying one thing, and the CEO implying another. Nice to hear, but I really dislike how they used an illustration that looked like the worst thing about the iPhone (the home screen) for the presentation. It seems like a cheap followers syndrome. Be proud of what you do well. Like in this article, show your own much superior home screen. Heh The basic reason why an iOS screenshot appears here is that everyone knows it and it has a great value as an example of what an OS optimized for phones is and what it isn’t. Examples work better when they are as extreme as possible. I’m not doing a full review of the handsets at all (for that I’d have to have both at hand, and it’d have to be much more lengthy), just comparing design of a specific feature (the home screen), from a specific point of view (communication accessibility). I have a Nokia phone from 2003, it has had no issues all this time, I use it every day. I actually owned a few other phones after this one, they all died. The phone after the one I use now was also Nokia/Symbian but was of worse quality. So I think phones might just be getting less attention to detail by their manufacturers. One died within one week and I knew from just using it in that week it was actually worse than the others that came before it. My Nokia phone from 2003 even has support for IPv6 supposedly (never tried though, because I need a provider with IPv6 because it has no wifi !). However, as a dedicated UIQ fan, I wish to add that I think you should also have mentioned UIQ at least once in your “Symbian Goodbye”-mail. I feel it deserves way more credit than it has ever been given by the mobile OS community. Although definitely not perfect (I still think especially the hardware-side is more to blame for this than the software-side), I think it was a better implementation of Symbian than Nokia’s S60 ever was or would have been. It’s user interface was generally quite well thought out. But even I think it was a very bad choice from the start that manufacturers were unwilling to support a platform of the other and decided it would be a good idea to create two completely incompatible (from the user standpoint) user interface layer above the same operating system. Sorry for my rant 😉 Keep up the good work! Sorry, I fear I’m too young to have met this variant of Symbian I’ve heard some facts about it in several places (including that it ran NetHack), but have never even read an in-depth review of it. By the time I started having a look at Nokia’s Symbian phones, UIQ was already dead. So obviously, I didn’t thought about it when writing the article either. You would have to be 15 or so to be too young? I remember having a http://en.wikipedia.org/wiki/Nokia_2650 at 15, and it was relatively similar. At least one of these runs s40, according to Wikipedia. For the 5110, I think wiki’s photograph is inaccurate because phones like this one weren’t common anymore when I was in high school. I still remember the days when everyone wanted to have it, how could it was that you didn’t add to strecht the antenna to be able to use like many mobile phones before it. It really makes me feel my real age. It was mainly a Sony-Ericson thing, and incompatible with S60 UI. Which was also a big problem in the Symbiam platform. I partly agree – I think the iPhone would be nicer if you could configure the lock screen to show summaries and allow some form of actions on them. The specific example seems a bit lacking, though. I know this is an extra step to take, but if I’m on my iPhone home screen, I can swipe or double-click to show the search and get a summary of contacts/mail/messages/whatever as soon as I start typing. It’s an extra swipe, but not really too difficult. But as I say, I think Apple could use a real summary lock screen (or even home screen with a swipe left for search / right for the apps type of thing…). And I do think the entire move to Windows Phone 7 is going to be a disaster. Unfortunately for Nokia, they just seem to have been complacent and got overtaken coming & going (high and low end). The more I read about Elop, his stake in Microsoft, etc., the more odd hiring him and having him immediately do a big deal with his former employer seems at the very least to be a conflict of interest. These are all details, but they show that Apple did not optimize the communication experience on their platform. They rather worked on things like the multimedia experience, web browsing, and of course the app ecosystem. I’m fine with that, they couldn’t work on everything at once and please everyone. But my point was that precisely, they don’t please everyone. Your definition of “communication” seems incredibly limited, but more in that in a moment. The only “call” button in the Phone app on the iPhone is directly in the middle directly below the numeric buttons. It is also bright green. What call button are you talking about? You’ve basically limited “communication” to your rather limited definition of SMS. For many people Facebook/Twitter/LinkedIn, etc are their primary communication vehicles. Email is a close second. How are the social networking clients on Symbian? Also, an iPhone can natively open attachments in these formats: “.jpg, .tiff, .gif (images); .doc and .docx (Microsoft Word); .htm and .html (web pages); .key (Keynote); .numbers (Numbers); .pages (Pages); .pdf (Preview and Adobe Acrobat); .ppt and .pptx (Microsoft PowerPoint); .txt (text); .rtf (rich text format); .vcf (contact information); .xls and .xlsx (Microsoft Excel)” And other applications can register to open attachments not in that list. Have you actually used an iPhone? Forget that. I encountered a fake iOS dialer screenshot when looking for a suitable home screen screenshot for the article, apparently. You’ve basically limited “communication” to your rather limited definition of SMS. For many people Facebook/Twitter/LinkedIn, etc are their primary communication vehicles. Email is a close second. How are the social networking clients on Symbian? Afaik, there are some, like on every single mobile OS nowadays. I’m not interested in these things, so I can’t tell. But even if you’re into social networking, iOS’ user interface still integrates those means of communication just as poorly as it integrates other means of communication. I’ve heard there are some UI tweaks for Android (like Motoblur) which can integrate these better, though, so in this case the rest of the high-end smartphone world is not necessarily as bad. You should clarify “natively”. In most people’s mouth, “natively” means “out of the box”. Only on Apple’s website (where this list is from, as far as I remember… I think I’ve already seen it somewhere) can you find file formats which require a third-party app to be opened listed as “supported”. And other applications can register to open attachments not in that list. Have you actually used an iPhone? Mostly played with an iPod touch. Toyed with an iPhone long enough to see that it worked in a very similar way and to wonder how people can claim that this is a phone. But for the nth time, I have different needs than the average iPhone/Android/WP7 buyer. Can’t we just get over it ? iOS is best for you, fine. Just admit that it’s not the perfect OS for everyone. Is it so hard ? So… without ever really tinkered with iPhone and comparing Symbian to iOS on iPhone…? Fine. But then most of people would not buy your words including me. Can’t we just get over it ? iOS is best for you, fine. Just admit that it’s not the perfect OS for everyone. Is it so hard ? Nothing is perfect at all. I find many people are happy with iPhone while also many people are happy with Symbian. And there also are people fine with either one. So… Can’t we just get over it? Symbian might be best for you, fine. Just admit that it’s not the perfect OS for everyone. Is it so hard? You should also listen to others. Happy to see that you get it Now, think about it : what is this article about ? The loss of a mature OS is always terrible news, but it’s even more terrible when it was one of the fews that didn’t just look like the others and provided some interesting choice. The original post’s point was “oh, you know, that’s not that bad, you can do it on iOS too”. My point was “yes, I can do that on iOS and Android, and I could also fry eggs on a friend’s Acer laptop when playing games on it, but there really are things better suited for these purposes, like Symbian (no, not for frying eggs)”. That’s all ! I really can’t see how we managed to get in such an argument. I miss my OS, he likes his, and that’s perfectly fine. This article (and the subsequent comment discussion) was just an attempt to make people like him understand why some people in the world are going to miss Symbian. Not to advocate that he should use it. I wonder what your standard is for an OS to be called a “mature OS”. It could be different from of others. It might be very different from mine… Of course, it might have mature UI for a specific situation. But that could be all. Anyway I am not really against Symbian at all but you could do better. Try iPhone for yourself before compare to Symbian. And it should be much much better if you could just get rid of that part and instead more focus on cool/mature features of Symbian and let the world knows if anythings are missed. Well, there are dozens of hobby OS projects started and ended each year, most of these never reached a useful state and won’t be missed. For me, “mature” means that the OS has met its initial goals and reached a stable state, where it is actually useful for some people. Anyway I am not really against Symbian at all but you could do better. Try iPhone for yourself before compare to Symbian. I’ve reached a good enough level of knowledge about iOS to know that it’s not what I want, why bother more ? And it should be much much better if you could just get rid of that part and instead more focus on cool/mature features of Symbian and let the world knows if anythings are missed. I thought my three points pretty much sum up what Symbian represents, implementation aside. The iOS part is here because I think the “phone-centric” aspect had to be clarified, by comparing symbian’s UI with a less phone-centric UI, and iOS’ one was the one which I knew best. But … something like every 1 in 12 people on the planet visits Facebook every day. Lacking first class support for these sites basically means that Symbian is missing one of the biggest communication mediums on the planet. Ignoring that because you aren’t interested is symptomatic of the kind of attitude that has caused Symbian to be in the position it is today. iOS’ user interface, as you pointed out in the article, is application specific not “communication” specific. The prominence of social networking applications in iOS is directly dependent on how prominently a user places it. Additionally, if the next version of iOS has something more like WebOS’ notification system, it more or less completely eliminates your “communication focused” UI argument and it still completely decimates Symbian in user interface, ease of use and application development platform. None of the file formats in that list require a third party application to open on either iOS or Mac OS X. Really, right out of the box you can open any of them. For the record, I’m not claiming iOS is best for anyone. I’m simply pointing out that you choose an incredibly narrow focus for criticizing it’s UI, and that many of your criticisms seem based on a lack of knowledge of it’s capabilities. Symbian, on the other hand, is long past it’s expiration date. EPOC32 was a terrible platform when Symbian was founded and it remained a terrible platform till today. Slapping Qt on top of it is simply putting lip stick on a pig. Nokia may not have made the best choice by picking WP7, but they certainly made the right choice by dumping Symbian. Besides, you don’t need thousands of third-party applications to access a website, one is sufficient, and zero can even be sufficient as long as the web browser is good enough and well-integrated… But I disgress. I don’t think we’re ever going to agree there, so I believe I’ll leave you thinking that Symbian is the DOS (or the Mac OS9 if you think it worked well once, take your pick) of mobile operating systems and go back to something more interesting on my side. If that was the primary design consideration in IOS I certainly don’t see it. Winphone 7, Motorola’s motoblur interface, those seem more tuned to that kind of thinking. I think a neutral observer would have to agree that iphone is more app centric and symbian is more communication centric. I just have one thing to say to you: Try a webOS phone. Not only is the “start-typing-to-find-something” (“Just Type”) one of its key features, but it also shows you notifications at the bottom of the screen regarding any kind of incoming communication–missed phone calls, SMSes, chat messages, e-mails, Facebook messages and (in the coming 2.1 version) Twitter. Tap on the notification, and the relevant app opens. Or flick the notification to the side and it stops bothering you. How’s that for communication-savvy? Also, there’s no need to go hunting for your communication apps in a big menu–you can just leave them all running in the background and flip through the cards to find what you’re looking for. Not to mention, even if the cards are all closed, you still don’t need to open a specific app to start an action–just start typing the name of the person and you get a list of options of ways of contacting them. Oh yeah, that works because the phone is smart enough to recognize the same person across services (“Synergy”)…. Speaking as someone who used to have a Symbian phone, webOS is *way* better. Why not As soon as HP start to sell an unlocked mid-end (< 300â‚¬) device lasting reasonably long on battery in my country, I could be very interested in WebOS. At the moment, the “unlocked”, “mid-end” and “battery” side of the WebOS ecosystem (at least the part available here) seem to be a bit lacking, sadly. Hope this is to change in the future. Well, depending on the price and availability of the Pre 3 whenever it comes out, I might just be looking to sell my unlocked Pre 2 for around 200â‚¬ at that time…. …battery life is around 2 days if you don’t do much with it, one day if you do a lot of web-based stuff . This was an excellent and thoughtful article that raised good points throughout. Well done and thank you for contributing it to OSNews. Personally, I never met a Symbian phone I liked (I’ve owned a few for testing purposes) but missed them entirely in their heyday. It’s a sad fact that the OS’ time has passed, as will eventually be the case with all operating systems. I haven’t used Windows Phone 7 but remain skeptical. I truly wish that Nokia had purchased Palm and taken WebOS as their own. (Or even better: If HP had licensed it to Nokia.) Still, I think that HP will run better with it than Nokia would have, had they purchased Palm. Having used Maemo, a platform that showed so much promise four years ago, I think it’s a good thing that Nokia has gone with an OS outside of its complete control. Anything owned or created by them directly would run up against too much organizational inertia with the Symbian folks. Witness Maemo, Qt, Meego and probably many other aborted attempts at modernizing that I’m not aware of. I am curious, what was the technical innovation of the MacOS classic? All the praise I’ve heard was about UI consistency, I don’t think I’ve heard much about the underlying OS. When the original MacOS came out it in 1984 it was very innovative. Many would argue that it offered the first usable GUI. Sure, it wasn’t the first GUI, and the underlying OS wasn’t great by 2011 standards, but it was nothing short of revolutionary in 1984. The original MacOS introduced people to the modern GUI, had great UI consistency, and held its own quite well for decades until other preemptively multitasking and multi-user systems became commonplace. The rest, of course, is modern history. Sure, the OS eventually needed to be replaced but on balance, it aged rather well, I’d say. Personally, I don’t miss symbian, for all the reasons the poster says people remember it. Clunky, slow, buggy, but yes, the UI in itself wasn’t that bad. What is sad that it indeed seems to represent the end of the era of the mobile phone being a phone. I don’t like the trend where everyone seems to want to shove a low memory low battery life small PC into my pocket. They seem to manage, since I also have an Android device currently, yet I hate I have to carry a charger/usb cable everywhere (and I almost never use data over 3G). Why do you people think we can’t see “normal” form factor (display on top, standard mobile phone keys below, no hd display, no touch screen, normal key control) phones being produced with Android on them? I’d buy it. Lots of people would. Well, afaik this is the kind of hardware which Android was initially supposed to run on. But where Android is now, it’d be hard to put it on a real phone. Too many parts of the OS and third-party apps are optimized for finger use, porting Android would require the same effort as porting Symbian on touch hardware has required. Maybe more, due to the performance side of things. Well, I’m not an android dev, but I guess a new UI for key control could be done if [market] demand exists. As hardware goes, there have been phones (having a “phone” form factor) with sub1G arm cpu’s running winmob6.x, and quite usable, similar hw capabilities could be enough to run a suitable customized Android. Also, since a smaller screen (well, 240×320 isn’t that small), most Android market apps wouldn’t be usable (especially games, good riddance), but that in my view would be a good thing. Just a [smart]phone (emphasis on the phone part) with a stable and good os and longer battery life. Just as an example, something similar in looks to the (good old Nokia’s) c3-01touch&type, but with android on it. I think Nokia should have re-designed from scratch the OS, instead of trying to patch it and add features that was never planned for. This is what Apple did with their MacOS 9 and came with MacOS X.
Nope. Apple tried to do that for years and failed miserably, so they bough NeXT instead and modified it to look and behave more like classic Mac OS. I think they’ve thrown Symbian out too early and not handled the communication of future direction well. Never announce that your products are obsolete until you have a replacements available to buy. I see lots of sub-Â£100 PAYG feature phones on sale in my local supermarket that look perfect for continued use of Symbian, with WP7 taking over at the high end – and gradually tricking downwards. Nokia are idiots. They literally allowed Microsoft to take their own market and destroy what’s left of Symbian (at least the high-end phone version – I have S40 cheap phone and the OS works perfectly, saves battery, and does everything such a phone has to do). But while Android is a CPU burner (I doubt WP7 isn’t), it’s developed from scratch for a touch interface and is a better smartphone OS than Symbian. Especially in the UI part where it captures the interest of young crowds previously in love with the iPhone. Well at least Linux runs the show here (current #1 spot), even if benath a semi-open platform. IMHO, WP7 is too radical, I doubt that Nokia will be happy with sales. It is a bad choice that people won’t stand in a row for, even if there’s Nokia brand on top and beefy hardware (and of course, top quality associated with the manufacturer). That’s why it is crucial to keep alternative at hand and that is Meego. Or secretly work on Android adoption and later, phase out Microsoft. … Except that Symbian is anything but great. Those annoying popups asking what data connection to use are something people have been complaining for years, but that Nokia chose to ignore. You can start typing in some edit fields just by focusing on them, while on others you have to click the selection button before you can start typing. Way to fail on UI consistency! In some Settings screens on/off settings are toggled just by clicking on the selection button while others will bring up an additional popup with two items (On and Off) when clicked. WTF?!? Everybody likes to focus on how Nokia failed to match the iPhone’s user experience but the truth is, not everybody likes the iPhone and not everybody wants an iPhone copycat. Nokia could’ve had the best darn anti-iPhone out there for users who value efficiency and productivity over trying to look cool. But they failed. Just like Microsoft failed with Windows Mobile and like RIM is beginning to fail in the latest BlackBerrys, Nokia decided not to improve the usability of their non-touch phones – where they were strong, in an attempt to succeed in the touchscreen phone arena – where they were weak. The result is that now two failing companies (Microsoft and Nokia) want to join failure with failure and expect success out of the whole thing.